The Eames Molded Plastic Chair perfectly embodies its creator’s famous credo: “The role of the designer is that of a very good, thoughtful host anticipating the needs of his guests.” The chair, with accordance to the credo, was designed on the principle of adaptability, offering a multitude of configurations to serve a wide variety of applications and environments. Today, the Eames Molded Plastic Chair can be found in homes, cafés, bars, lobbies and offices around the globe, proving that the chair is a truly versatile piece of furniture. The chair was designed by the husband and wife design team, Charles and Ray Eames, and comes from a period when the famous duo was experimenting with new types of materials and manufacturing processes. The prototype of the chair first came into the limelight in 1948 at the International Competition for Low-Cost Furniture Design, organized by the Museum of Modern Art in New York. The prototype’s seat was made from the metal sheet, which was pressed into the desired shape. Nevertheless, the Eames continued to push the boundaries of what the shell chair could be, which resulted in introducing the chair’s seat made from fiberglass in 1950. Despite the relative ease of molding, the environmental risks associated with the fiberglass production became more widely understood and tipped the scales in favour of discontinuing the fiberglass shell production until a more suitable material could be found. The chair was brought back to live in 2001 by the Herman Miller furniture company, which reintroduced the Eames Molded Plastic Chair with the seat manufactured from environmentally friendly polypropylene. The overall appearance of the chair is extraordinarily appealing and stylish. It is very proportional and well-balanced and the use of the frame base makes it look both airy and light. In contrast to fully-upholstered furniture, it does not obstruct the room in which it is placed but enhances the perception of spaciousness. Even today, almost seven decades after its presentation, chair has neither aged nor become trite. It still looks fresh and contemporary. This characteristic of a good design is particularly well depicted by Eames Demetrios, the couple’s grandson, who once said: “The chair that Charles and Ray were designing, is the chair that’s made tomorrow.” The simple, gracious form of the chair fits any body and every place. Although the chair looks like a masterpiece of modern art, it is fully functional and surprisingly comfortable. Its shell is manufactured from polypropylene, which is 100 percent recyclable. The high level of comfort can be attributed to the deep seat pocket and waterfall seat edge, which reduces the pressure exerted on the back side of the user’s thighs. In order to reach the absolute heights of comfort, customers can order the chair with the layer of dense foam cushioning upholstered in a wide variety of durable fabrics. The rubber shock mounts, yet another item on the Eames’ inventions list, are placed between the shell and the base, which allow the chair to adapt to the user’s position. The chair is available with four different bases: 4-leg Base, Stacking Base, Wire Base and Wood Dowel Base. In first two options, the base is made from bent steel tubes. The wire variant is much more sophisticated and appealing, resembling the truss structure of the Eiffel Tower. Last but not least, the wood dowel base, as the name suggests, consists of four wooden dowels tapered at both ends. Dowels are spanned with the diagonal crossbars for additional structural strength. The chair is available in various configurations of upholstery and wood finishes, including: maple, white ash, ebony stained white ash and walnut. At the customer’s request, the metal parts of the chair can be painted in either white or black, as well as chrome coated. This diverse selection of options enables customers to create their own perfect chair. This piece of furniture is a perfect combination of an astonishing form and exceptional functionality. It still looks fresh and intriguing, making it a great, tasteful addition to any modern interior. In addition to the environmental aspects, the fiberglass shell had one additional drawback – the glossy surface finish. Charles Eames was very dissatisfied with this particular characteristic of the fiberglass moldings and it wasn’t until after his death that the matte finish he so greatly desired was achieved. Besides being 100 percent recyclable, the polypropylene shell’s subtle matte texture offers a soft tactility as well as significantly improves its durability. The origins of the chair’s design can be dated back to the beginning of the Modern Movement. In contrast to the historic trend of incorporating the past in furniture design, this era was defined by the idea of making timeless, universal objects that would resist the passage of time. This belief led to more simple, pure designs that were less prone to becoming obsolete. The concept of the simplified design was later developed by the Bauhaus, whose main principle was to make everyday mass-produced objects beautiful yet practical and still attainable by ordinary people. This idea was always present in the designs of Charles and Ray Eames, who tried “to make the best for the most for the least”. 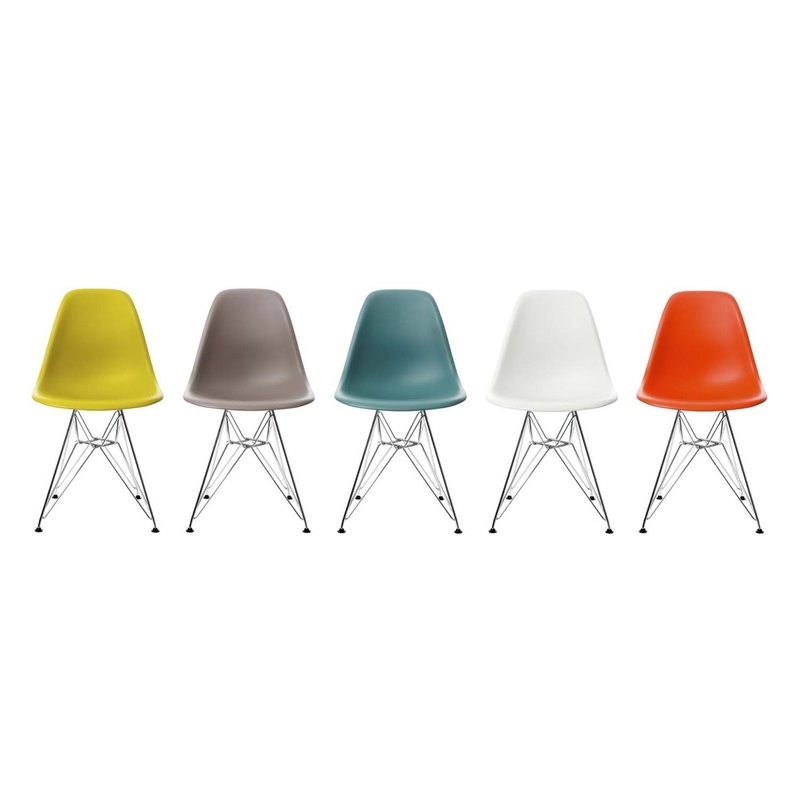 Their creations, such as the Eames Molded Plastic Chair can be found in households, bars, offices and even hotel lobbies.